Auditions will consist of readings from the script and/or your prepared dramatic piece. A prepared dramatic piece of 1-2 minutes is preferred but not required. Please be prepared to stay for a few hours. Please bring all of your conflicts for May 4, 5, 11 and 12 and between July 6 and September 1. 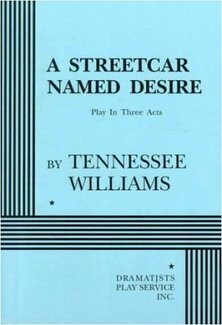 ABOUT THE PLAY: A Streetcar Named Desire, a play by Pulitzer Prize Winner Tennessee Williams, that reveals to the very depths the character of Blanche DuBois, a woman whose life has been undermined by her romantic illusions, which lead her to reject—so far as possible—the realities of life with which she is faced and which she consistently ignores. The pressure brought to bear upon her by her sister, with whom she goes to live in New Orleans, intensified by the earthy and extremely “normal” young husband of the latter, leads to a revelation of her tragic self-delusion and, in the end, to madness. One early Read-Through will be held on either Saturday, May 4 or 5 or Sunday, May 11 or 12. Casting may not be finalized until AFTER that Read-through. from 1:00-6:00pm on Saturday, July 6 and another from 1:00-5:00pm on Sunday, July 7. Rehearsals(5 per week: Mon-Thurs eve and Sun afternoons) will commence on Tuesday, July 9. The Director strongly advises that actors read the play before attending the auditions. BRECKSVILLE THEATRE IS CASTING 6M AND 6W (PLUS 3-5 MINOR CHARACTERS). Blanche DuBois—Age Early-Late 30s (could be an older actress who can look younger—Jessica Lange and others who played her were in their 50s), about 5 years older than Stella: A flirtatious Southern Belle. While still beautiful by any objective standards, Blanche sees herself as a fading beauty. She is moving inexorably toward a tragic breakdown. She might be a manic-depressive. She has symptoms of neurasthenia, a somewhat vague psychological term for people who variously appear tired, distracted, and nervous. She is alternately self-confident and full of crippling self-doubt. Blanche is a compulsive liar, possibly what used to be called a nymphomaniac. We see most of the story through Blanche’s eyes. Blanche is onstage for the entire play, i.e. No Blanche=No Rehearsal. Stella Dubois Kowalski—Blanche’s sister, about 5 years younger than Blanche: Glowing and attractive, ferociously in love with Stanley. While she comes from the same “Southern gentility” upbringing as Blanche, she has adapted well to her somewhat diminished world. She is pregnant with their first child. Like Blanche, Stella is a sexual person, but handles it so much better. Harold “Mitch” Mitchell—Age 30s, roughly the same age as Stanley: Served with Stanley in WWII, where they became friends. Less brutal and more sensitive than Stanley, Mitch aspires to marrying Blanche. Mitch is honestly devoted to his sick mother and more caring and kind than Stanley’s other friends. YES, I'm interested in an audition!